Tenedos is an island of Turkey in the northeastern part of the Aegean Sea. Administratively, the island constitutes the Bozcaada district of Çanakkale province. 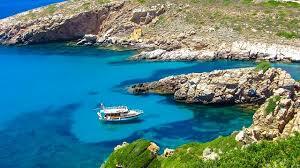 With an area of 39.9 km2 (15 sq mi) it is the third largest Turkish island after Imbros (Gökçeada) and Marmara. In 2011, the district had a population of 2,472. The main industries are tourism, wine production and fishing. The island has been famous for its grapes, wines and red poppies for centuries. As Tenedos, it is mentioned in both the Iliad and the Aeneid, in the latter as the site where the Greeks hid their fleet near the end of the Trojan War in order to trick the Trojans into believing the war was over and into taking the Trojan Horse within their city walls. The island was important throughout classical antiquity despite its small size due to its strategic location at the entrance of the Dardanelles. In the following centuries, the island came under the control of a succession of regional powers, including the Achaemenid Persian Empire, the Delian League, the empire of Alexander the Great, the Kingdom of Pergamon, the Roman Empireand its successor, the Byzantine Empire, before passing to the Republic of Venice. As a result of the War of Chioggia (1381) between Genoa and Venice the entire population was evacuated and the town was demolished. The Ottoman Empire established control over the deserted island in 1455. During Ottoman rule, it was resettled by both Greeks and Turks. In 1807, the island was temporarily occupied by the Russians. During this invasion the town was burnt down and many Turkish residents left the island. Under Greek administration between 1912 and 1923, Tenedos was ceded according to the Treaty of Lausanne to the new Turkish republic that emerged with the dissolution of the Ottoman Empire in 1923. The treaty called for a quasi-autonomous administration to accommodate the local Greek population and excluded the Greeks on the two islands from the wider population exchanges that took place between Greece and Turkey. 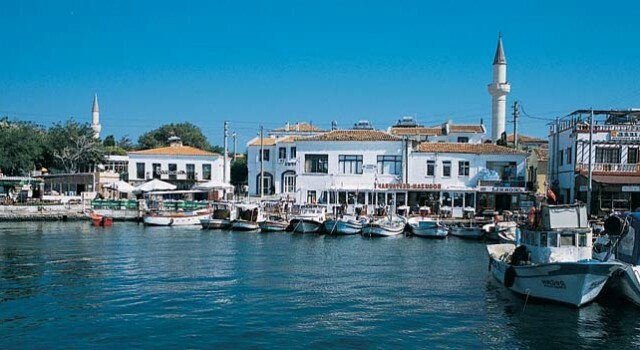 Tenedos remained majority Greek till the late 1960s and early 1970s, when many Greeks emigrated because of systemic discrimination and better opportunities elsewhere. Starting with the second half of the 20th century, there has been immigration from mainland Anatolia, especially from the town of Bayramiç.